The Brentwood neighborhood was developed before the City adopted the current stormwater code. Erosion in the area currently threatens streets, utilities, and houses. This study will generate feasible, cost-effective solutions to flooding and stream erosion and incorporate water quality solutions for stormwater runoff. The Brentwood neighborhood’s drainage problems rank as a high priority for the Watershed Protection department. Developed throughout the 1940s and 1950s, the Brentwood neighborhood was built with small storm drains that result in frequent street and structure flooding. Further development of the neighborhood was completed largely without stormwater control measures. Creek channels have widened as a result, and erosion threatens streets, storm drain outfalls, utilities, culverts, houses, fences, and yards. Multiple studies have been done to evaluate the flooding in this area. 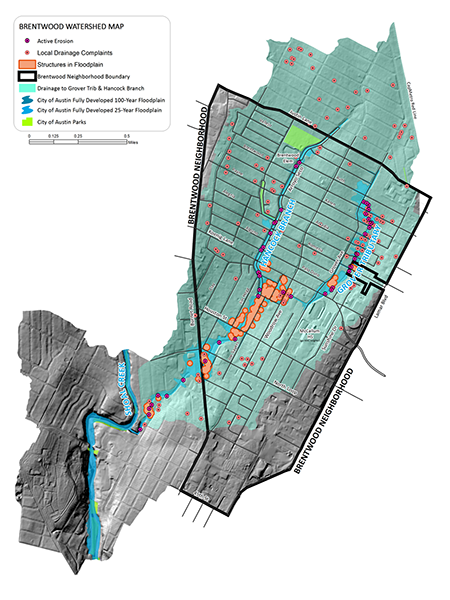 The data and models generated by these past studies will be used in this project to develop a long-term solution to the area’s drainage problems. The Brentwood neighborhood study area includes the entire drainage basin of the Hancock Branch to Shoal Creek, including the Grover Creek Tributary. The City’s engineering consultant analyzed a multitude of drainage improvements to reduce flood risk throughout the Brentwood Neighborhood. The City is selecting the four most promising options for in-depth evaluation.